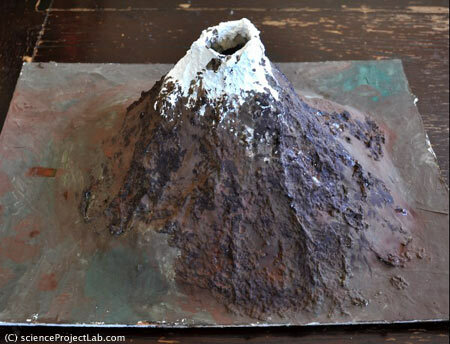 Volcano science project is probably the most popular science fair project in the world. It's fun and easy. It's good for first or second graders. Build your own model from empty bottle, cardboard, few old newspapers and some other bits and pieces available in your household. 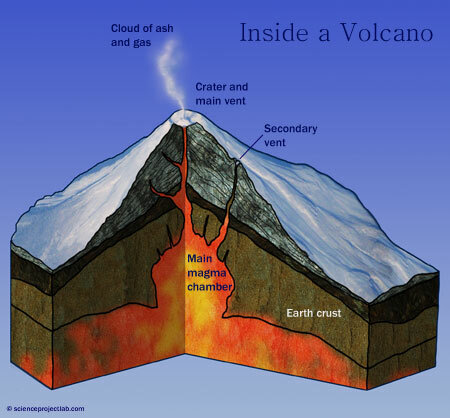 Do you know that there are many different types of volcanoes? There are only few regions on the Earth where you can find volcanoes. Do you know why? Do you know that volcanoes can support life? But they also may cause some catastrophic events. Have you heard of Pompei, Taravera, Krakatau? We're going to model a stratovolcano, as it's the most impressive looking type of volcano. Look at the scheme below. 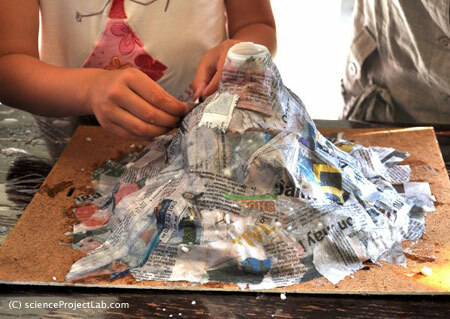 There are many materials you can use to make a model for your volcano science project. For the lava chamber it's best to use a small plastic bottle. The Cone can be built from plasticine, play dough, paper mache, or even sand and clay. In our case we will use paper mache as it's very easy to make, all ingredients are readily available and the model will be very lightweight. It will take a few days to prepare. 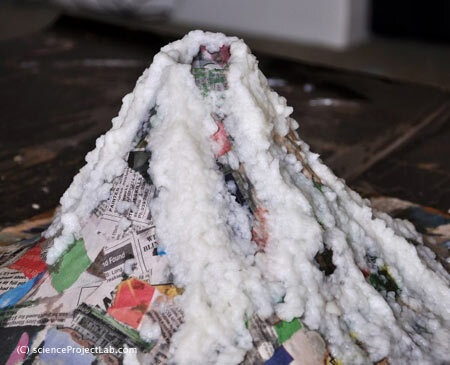 If you want to save time or you don't want to deal with paper mache you may consider buying a ready to use volcano model or use another material. Place a bottle in the middle of cardboard and stick it to the cardboard with sticky tape. Make sure it is fastened well. Crumple few pieces of newspaper in the rough spheres, and place them around the bottle and fasten with cello tape to the bottle and cardboard, so that they form rough cone. Put bottle on the cardboard and fasten it with cello tape. Form rough volcano cone out of crumpled newspapers. Cut or tear newspaper into the small roughly square pieces. 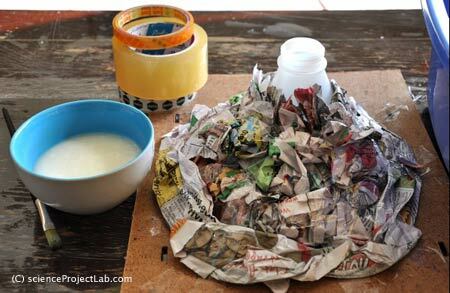 Glue them to the bottle and newspaper cone to form a volcano shape. Kids love this stage of the project! You'll need to make several layers of paper mache. Every time the layer is complete let volcano model dry before starting a new layer. In the end you can sculpt with paper mache some folds and lava flows to make your volcano model more realistic. 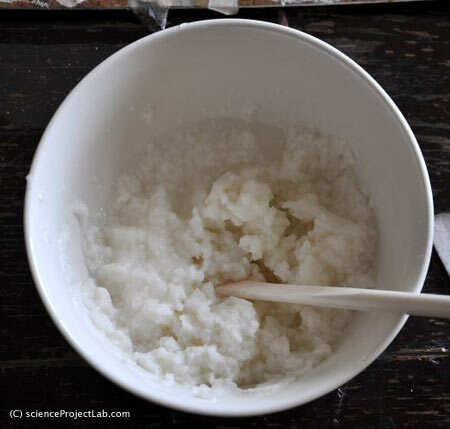 You can prepare paper pulp from toilet paper. Put some in the water and let it dissolve into pulp that look much like mushed potatoes. Remove excessive water and add some glue. Paper pulp prepared from toilet paper. Now you can use this pulp to form some ridges and lava flows on the smooth cone of your volcano. 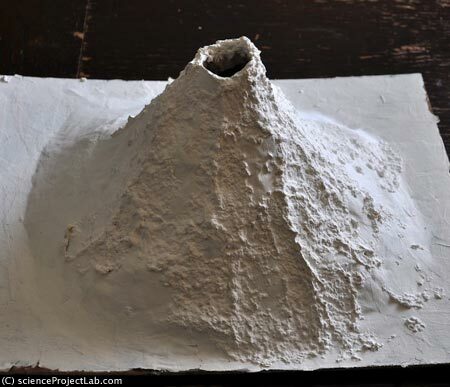 When the volcano model is completely dry it's time to paint it. It may take a few days to dry out completely! First you might want to paint the base layer using emulsion paint. We used white paint which was a mistake - it's hard to paint dark rocks on the white base layer. So we've got volcano covered with snow. You can use gouache or acrylic paint which is relatively water proof when dried. You can also glue some sand and pebbles and even plant some moss on the slopes of your model to represent boulders, lava flows and forest! Similar techniques used filmmakers of the last century building models for Hollywood movies. Use the mixture of vinegar, starch and red food coloring to represent the lava. Baking soda will react with vinegar and turn on the volcano eruption. Put baking soda powder inside the bottle in the volcano model (our lava chamber). Add red food coloring to the vinegar. We also add some starch to the vinegar to add some viscosity to the lava. Some people recommend to use soap flakes which suppose to add more volume to the eruption. Another possible recipe for lava is 50/50 dry mixture of lemon acid and baking soda. You can try to add some starch or sand to this mixture to get better lava. Put this mixture in the lava chamber (it should be dry!) and add some water to trigger the eruption.